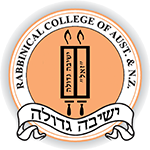 The Rabbinical College of Australia and New Zealand (Yeshivah Gedolah – Melbourne) hosted a community Kinus Torah on Sunday the 13th of Sivan (May 31, 2015). The Kinus was convened in conjunction with Shavuos, as per the Rebbe’s directive that a Kinus be held on, or after, each Yom Tov. The Kinus was coordinated & chaired by Shliach Motti Rubin. The program began with an in-depth analysis of a Sicha regarding the exact definition of the Torah studies of a child, delivered by Shliach Mendel Shuchat. This theme was further elaborated by Rabbi Binyomin Cohen (Rosh Yeshivah) with a Pilpul on the words of the Rambam elucidated with a Biur from the Rebbe. Rabbi Mottel Krasnjanski (Ohr Chadash – Caulfield Shul) delivered an intricate Halachic discourse on the topic of whether a Mitztaer (someone in pain) is still obligated to perform Mitzvos. Rabbi Moshe Donenbaum (Heichal Hatorah and Rosh Yeshivah – B'tzail HaChochmah) presented a detailed overview investigating the rights that an agent or proxy may have to transactional bonuses. Dayan Katz (Adass Yisroel and Rosh Kollel Bais Yosef) spoke about the great enthusiasm with which one must learn Torah and perform Mitzvos, and he also enumerated the advantages of not utilizing a city-wide Eruv. Rabbi Zvi Telsner (Yeshivah Centre) focused on the reasons and sources for making Kiddush on Yom-Tov. Rabbi Yonasan Johnson (Rosh Kollel Menachem Lubavitch) analysed the Alter Rebbe’s unique opinion regarding tying a knot on Shabbos. The Rabbonim were followed by a number of students who spoke clearly and succinctly. Berel Groner (Yeshivah-Gedolah) elaborated on a Sugya in Masechta Gittin, Yosef Shmuel Greenbaum (Mesivtah) discussed the various customs of the congregation’s response to the recitation of Kaddish, and Yaakov Smukler (Yeshivas Ohalai Yosef Yitzchok Lubavitch - Yeshivah College) examined the efficacy of Geirus when there is no Beis Hamikdash. A large and diverse crowd attended and they thoroughly enjoyed the wide variety of subjects addressed at this year’s Kinus. We would like to thank the many Bochrim and Shluchim who made the Kinus a true Kiddush Hashem and Kiddush Shem Lubavitch. Yeshivah Gedolah recently hosted the Bostoner Rebbe, Rabbi Mayer Alter Horowitz, of the Har Nof, Jerusalem. Rabbi Horowitz delivered a captivating Shiur for the students.